Field input attributes are ONLY used in an IBM i RDML environment. All RDMLX and Visual LANSA RDML field attribute settings are set at the Partition Level. Refer to Field Type enabled in Partition for more information. These field input attributes are ONLY used in an IBM i RDML environment. Input attributes are optional and define how a field is displayed when it is used as an input field in a function or on a form. Most input attributes, such as color, are used in functions because Visual LANSA forms define how fields are displayed using visual styles. Input attributes such as Hidden Field (for passwords) or Lowercase (allow lower case text to be entered) are used in both. If no input attribute is selected, it defaults to either the alphanumeric (type A) or numeric (type P or S) system default values. Lowercase entry allowed. Refer also to Locale upper casing required. Specify the default input attributes to be assigned to a new alpha field. Specify the default input attributes to be assigned to a new numeric field. Specify the default output attributes to be assigned to a new alpha field. Specify the default output attributes to be assigned to a new numeric field. These default are used when LANSA files are initially created. This default is used when initially creating LANSA files. The initial number of records, the increment number of records and the maximum increments may be specified. The parameter must be a valid IBM i size parameter. This default level check, LVLCHK, parameter is used when initially creating LANSA files. This default commitment control value is used when initially creating LANSA files. It specifies whether or not the file is to be placed under commitment control. Refer to Commitment Control in the Technical Reference for information. Set this option to Y to indicate that physical files and logical files on IBM i are to be built using SQL as much as possible when in an RDMLX partition. The physical file will be built as an SQL table. Logical files will still be built using DDS, but in such a way that their access path will implicitly share the access path of an SQL index where the IBM i allows it. 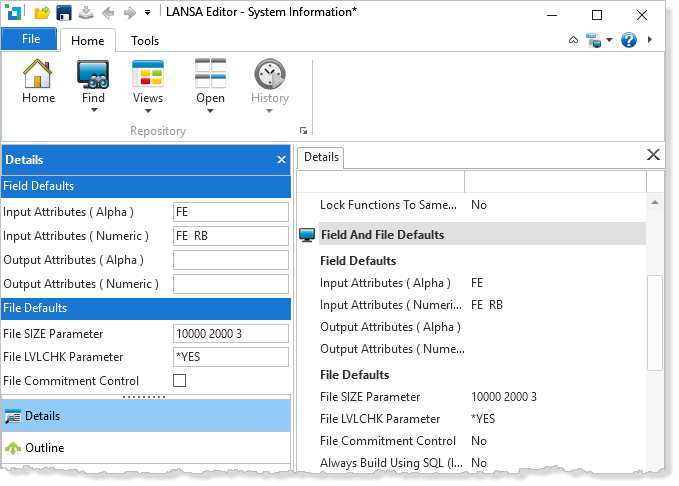 Refer to the Always build using SQL option in Field and File Defaults in the LANSA for i User Guide.